‘Narthaki’ festival is a SPARC initiative to honour and encourage different art forms and artists from Indian classical dance background. Dr. Sunanda Nair, founder of SPARC wanted to build a community around her that appreciates and understands the values of diverse art forms that exists in our culture. This year SPARC’s Narthaki commenced with a beautiful, vibrant performance by a young talented artist Jwala Priyadharsini Rejimon. 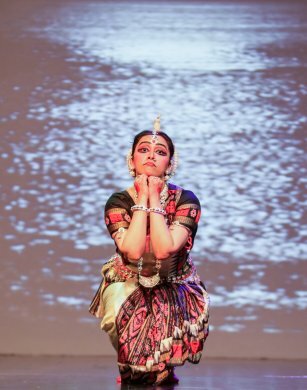 She is the founding member of Nrityapriya Fine Arts Inc, had completed her arangetram in August of 2015 with her guru Mangala Anand, who teaches the Vazhuvoor style of Bharatanatyam. Jwala started the show with a pushpanjali in which she showed her mastery in adavus. With her fast, precise movements, it was a perfect start to Narthaki. Jwala continued with an item in praise of Lord Ganesha (Hamsadwani, adi) in Mysore style taught by her guru Mangala Anand. Next she entertained the audience with a slokam, Lakshmi ksheera samudra raja tanayaam in praise of Lakshmi Devi. She impresed the audience with her graceful abhinaya and effortless moves. Jwala’s commitment to her dance as a whole was very visible in her performance. Her attention to details was commendable. 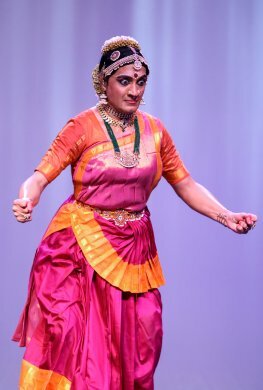 Dr. Aparupa Chatterjee, the artistic director of the Odissi Dance Company, an Austin- Texas based organization, is a leading Odissi dancer in India and USA and a former repertory member of Srjan. A disciple of Guru Ratikant and Sujata Mohapatra, Aparupa had brought Odissi to Texas in 2007. She started with Santakaram Bhujaga sayanam, a Vishnu vandana to mark the entrance of the dancer on stage. The dancer invokes blessings of lord Jagannath for an auspicious beginning, and offers salutation to the Mother Earth, the Guru. Then followed a prayer to lord Vishnu, the Supreme being. “I bow to him, the master of the universe, who is ever peaceful, who reclines on the great serpent bed from whose navel springs the lotus of the creative power who is omnipresent, dark like clouds, the lord of Lakshmi, the lotus eyed one and the destroyer of the fear of samsar.” She said it all with absolute lasyam. She continued with a Vasant pallavi choreographed by Guru Kelucharan Mohapatra. Pallavi is an elaborate pure dance item, enhanced by the artistic steps and the creative music that accompanies it. The graceful and lyrical movements are supported by intricate rhythm patterns of exceptional beauty. From her Pallavi she transported her audience to the next level by Barajaku chora asichi gheni jibo, an endearing Oriya abhinaya composed by Guru Kelucharan Mohapatra reflecting the love and patience of mother Yashoda in her endless efforts to put her dear Krishna to sleep. She transformed herself into Yashoda who tries to play tricks on Krishna by trying to scare him with story of a thief prowling the streets at night in search of kids who are not asleep and puts them into his sack. The performance was greatly appreciated. Audience was still with Aparupa’s little Krishna when Aswathy Nair, daughter/disciple of Kalamandalam Saraswathy, came out with her well scripted Mohiniattam. 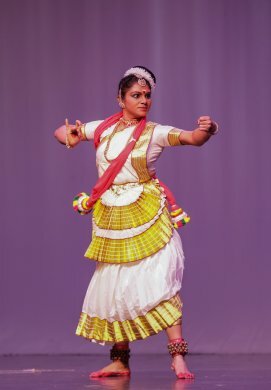 Aswathy is trained in three forms of dance, namely Bharatanatyam, Mohiniattam and Kuchipudi. Aswathy captured attention of the audience quickly as the stage turned into a beautiful wedding arena where bride-to-be Amba was getting ready. Aswathy portrayed Amba’s excitement and impatience well. Her transformation from Amba to Sikhandi was thrilling. Within thirty minutes she took the audience through an emotional roller coaster from happiness to helplessness to determination to revenge and finally ultimate satisfaction. Narthaki culminated with a performance of Srikanth. Since the age of six, Srikanth has been on the stage, first as an actor in the Bhagavata Mela dance drama of Melattur, and then as a dancer of Bharatanatyam. In the all-male Bhagavata Mela, he has specialized in performing female roles, such as Sita, Devaki, etc. The perfection Srikanth has attained in these roles has won him accolades. A dancer, actor, and nattuvanar, Srikanth’s training in music and inherent love for literature adds a greater depth to the artiste. Such a background set audience expectations high. Srikanth came to the stage as Brahannala, a transgender character of Mahabharata. Arjuna, who turned into Brahannala during his exile due to a curse, went through a gamut of emotions. He lived the life of a woman without any acceptance from his family. What amazed everyone is Srikanth’s strength in demonstrating lasya as Brahannala. Then in the second half he took off his lasya bhava and performed as the hero Arjuna. It was an extraordinary experience for the audience. What a way to end a beautiful night!